At Paramount we deal with multiple manufacturers allowing us to provide as many options as possible for a wide variety of residential consumers around Reading PA, Lancaster PA, Lebanon PA, Harrisburg PA, Allentown PA, Philadelphia PA, and Scranton PA. If a consumer is over 300lbs we offer the Acorn and Brooks HD Straight Stair Lift, which can handle up to 350lbs in a residential setting. If the consumer is over the threshold of 300-350 lbs we would look to install a Bruno 2010 Stairlift which is capable of handling up to 400 lbs. These are all straight residential stairlift applications, in the situation where there is a set of steps up to a landing then more steps in any direction we would suggest a Bruno Custom Curve Stair Lift. This unit also handles up to 400 lbs. The Bruno Custom curve can also be installed in a commercial setting. 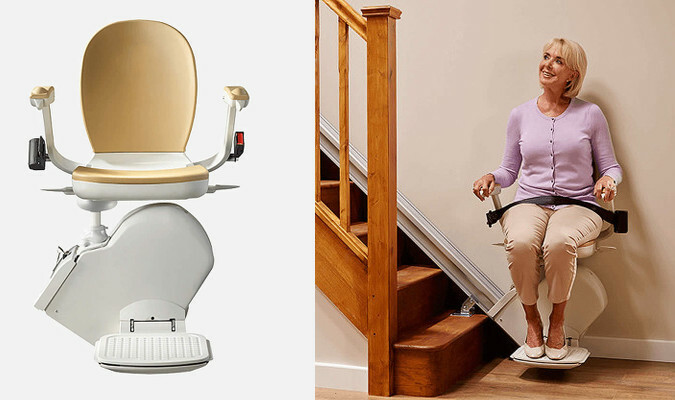 Paramount Living Aids aims to provide the right residential stairlift for your needs, and can provide custom modifications like seat size and foot rests. We have already installed many residential stairlifts to satisfied customers in Lancaster PA, Harrisburg PA, Allentown PA, Philadelphia PA, and Scranton PA. Give us a call at 484-408-0397 or email us at info@paramountlivingaids.com with any questions you may have or if you are interested in our smooth and comfortable stairlifts or other aids. If you have any questions about our services in Reading PA, Lancaster PA, Lebanon PA, Harrisburg PA, Allentown PA, Philadelphia PA, and Scranton PA, feel free to contact us. The two installers were excellent. Not only did they provide ideas, but they were very concerned about my wife’s needs. Your company was outstanding all the way from the beginning to end. The men were awesome. Very informative and left us understanding how the stairlift worked!! Kudos!! Very happy with the quick response to install our unit, when I explained how important this was for my wife. Thank-you so much for the friendly purchase and installation. Shout out to all who came out and fixed my son’s ramp. You made it right. It now is perfect. You stood behind your work and put the consumer first. So pleased. Would highly recommend this business. Since my wife had a fall, she could no longer go downstairs using the stairway. Now, with the stairlift, she can go downstairs anytime she wants. This is a really big help to her. Also, we were very pleased with the service we received. We would certainly recommend Paramount Living Aids to our friends! Thank-you! The young men who installed our chair could not have been nicer! Very polite and made sure to answer all our questions. Thank-you so much! The men that came to do the ramp were extremely pleasant and very helpful explaining all my questions. I thought everything was great. Very friendly, very efficient, very clean. We had other vendors advise us and offer an estimate. Paramount was much more efficient and personable. Paramount Living Aides LLC is a company that espouses all that is meant by service. They truly demonstrated what is meant by going the extra mile. I will recommend them to anyone who could use their services. This is unequivocally a great company. Thank you gentlemen. I would like to say that the guys that installed the stairlift did a very good job. They were pleasant and explained everything clearly and they did a wonderful job! The guys that came out to my home were absolutely great! They were kind and considerate and they explained everything they did day by day. Chuck was absolutely wonderful and a very hard worker. The bathroom is a life changer for me and I am so happy with how beautiful my bathroom is. I would recommend him to everyone. Thank-you for making my quality of life much easier! God Bless! Quick service/needed it installed quickly and the company worked hard to get product. Thank-you very much for your quick service on the order. The chair is working out well. They were very pleasant and professional! They addressed my questions and concerns. They were very helpful. Represented your company very well! Installers were timely, professional and friendly. Total price was lower than Acorn estimate I received on the phone…..BRAVO! Thank-you, great job! Very Pleasant young men! Actually arrived early and finished in less than an hour! Explained everything well and we are very satisfied. Explanation of operation and practice is very good. I could operate with ease. Our installer explained what he was doing every step of the way. He was very prompt and took pride in his work. We are very happy with the results and would recommend Paramount Living to friends and family. We were in need of prompt, flexible, reliable service. We got that and more. Paramount is exceptional in every facet including customer relations and sensitivity. Always a pleasure doing business with Paramount! Your two men were very courteous and very professional. They were also very helpful explaining everything to my husband and myself. Thanks so much! Copyright © 2019 Paramount Living Aids. Paramount Living Aids provides people with mobility impairments with personalized home modifications to ensure safety and independence in their home. With Paramount Living Aids, people with mobility challenges can move around home independently and safely. Paramount Living Aids helps our clients maintain the highest quality of life. This independence is gained by making modifications to the home as simple as grab bars or outdoor ramps, or even out outdoor stairlifts and indoor stairlifts. Paramount Living Aids offers indoor and outdoor stairlifts, straight stairlifts and also curved stairlifts, modular ramps and portable ramps, vertical platform lifts, sit to stand chairs, vehicle lifts, scooters, grab bars, and professional installation of home modifications. We are locally owned and operated. Serving Reading PA, Lancaster PA, Lebanon PA, Harrisburg PA, Allentown PA, Philadelphia PA, Scranton PA and beyond for over 16 years. We are fully licensed and insured! We are located at 225 N. Kenhorst Blvd. Reading PA 19607. We can be reached by phone at 484-408-0397 , by fax at 610-796-4739, and by email at info@paramountlivingaids.com. You can also find us on facebook and google+.